A "totally new species" of dinosaur has been discovered in China,offering more clues into the creatures' lives before they became extinct. The fossilized Tongtianlong limosus, or "muddy dragon on the road to heaven' was found on a building site in southern China and promptly nicknamed the "mud dragon." "The fossil was found by workmen who were building a high school," Dr. Stephen Brusatte at the University of Edinburgh told Sputnik. "They were blasting away the bedrock with dynamite and almost destroyed the fossil — but thankfully the dynamite exposed this skeleton. Without it, we would never know this dinosaur ever existed." Dr. Brusatte added. The bird-like species was preserved, almost intact, lying on its front with its wings and neck outstretched. It's believed that the creature died in this pose after becoming stuck in the mud around 70 million years ago. The two-legged animal belongs to the family of feathered dinosaurs called oviraptorosaurs, which usually have short, toothless heads and sharp beaks. 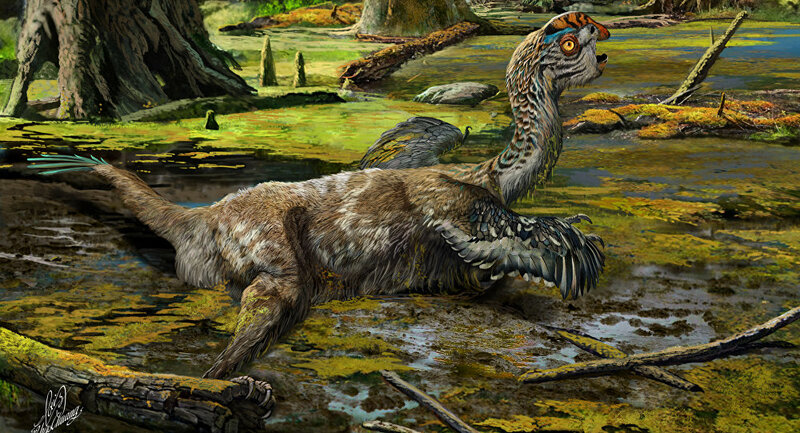 "The oviraptorosaurs were part of the final wave of diversification before the asteroid hit. There were lots of them, and they were still evolving into lots of new species like Tongtianlong," Dr. Brusatte explains. But what makes the mud dragon differentiate from its close relatives, is its skull, Dr. Brusatte pointed out. "It has a convex helmet-like crest of bone on top of its head that it likely used for display, to attract males and intimidate rivals." Dr. Brusatte explains that this "sixth new species" were already diversifying during the final few million years before the asteroid ended the dinosaurs and "tells us that dinosaurs were still doing quite well in this part of Asia." Researchers from the University of Edinburgh and China carried out the study published in Scientific Reports and carried out in collaboration with the Institute of Geology, Chinese Academy of Geological Sciences and the Dongyang Museum. "This new dinosaur is one of the most beautiful, but saddest, fossils I've ever seen," Dr Brusatte admits. "But we're lucky that the mud dragon got stuck in the muck, because its skeleton is one of the best examples of a dinosaur that was flourishing during those final few million years before the asteroid came down and changed the world in an instant," he said.